Prayer is the way in which we communicate with God. I have experienced a huge positive impact in my marriage because of prayer. Whether my husband and I have faced good times or really difficult trials, prayer has brought us closer together to each other and closer to God. And when we were extremely broken, ready to give up all together, God heard our prayers and He saved us! He saved our marriage! Prayer is beautiful. Just having intimate access to talk to God and knowing He desires to hear from us is pretty incredible. Then as we specifically pray for marriage, it aligns our hearts with His will. To go even further, when we pray with our spouse, they get to hear what we say which is usually a glimpse into the depths of our hearts. In all the years my husband and I have prayed together I can attest that it is remarkably affirming. Prayer is vital. Submitting to God through prayer is something that I do, because it changes my heart and my outlook on life for the better. Without prayer, I would have no hope of help. I would feel completely isolated and alone in my most personal struggles. Prayer is an anchor of hope in my life! My husband and I are advocates for couples praying together, praying for their marriage. When we are encouraging other husbands and wives we stress the importance of prayer. Why? Because the power of prayer transformed us and we want others to experience it! We also decided to write resources that will help teach and challenge a husband and wife pray for each other. We also did this because of the response/need we heard from people expressing how hard prayer can be or that they didn’t know where to start. Thirty-One Prayers For My Wife & Thirty-One Prayers For My Husband are books that will help a husband and wife pray specifically for different areas of life for each other. We chose 31 prayers to make sure that every day of the month is covered! We also added blank pages after each prayer for people to make these prayers more personal. My challenge to you is to commit to praying for your marriage on a daily basis. Start with one month, 31 days, and challenge yourself to pray for your spouse. If you want to get Thirty-One Prayers to use as a guide it will help you focus on very specific parts of your spouse’s life to pray for. Grab the book bundle HERE at a discount and invite your spouse to do the prayer challenge with you! 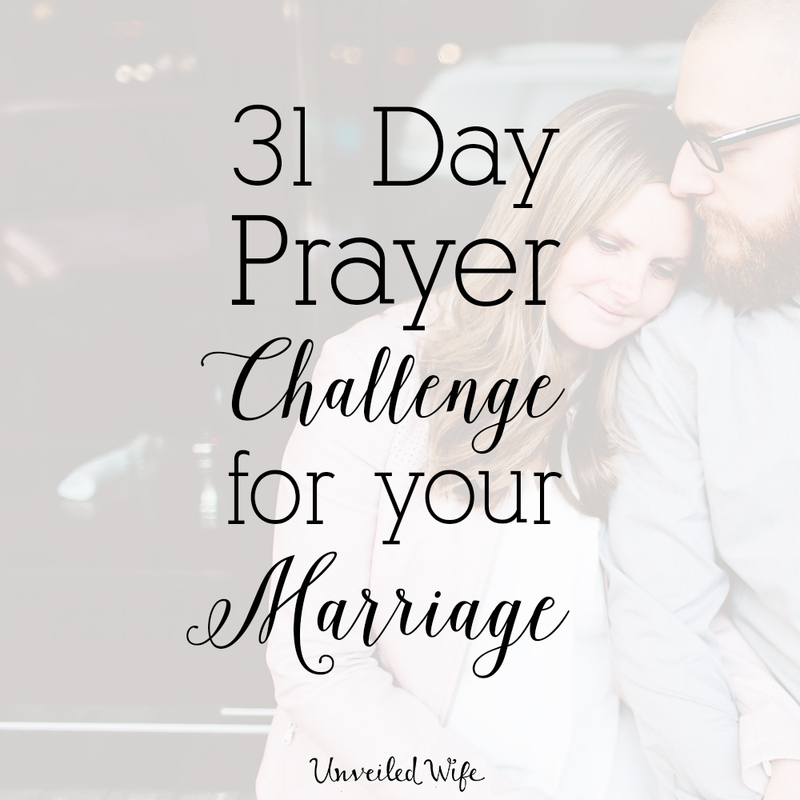 Otherwise, you can commit to 31 days of prayer and make your own list of how you want to pray for your marriage, focusing on a different topic for each day. Either way, my heart is to encourage you to be praying for your marriage on a daily basis. Prayer is so significant and I know God wants to hear from us. “Jason and I started 31 Days of Prayers for each other, this week and it has been amazing! Plenty of Tears and then laughs and a whole bunch of hugs and kisses in between! One of my main goals this year is to become a more Godly wife to my husband! I am so thankful for these books from @unveiledwife and her husband! I can’t wait to watch God work in our lives! I would definitely encourage all couples to participate in this 31 day Challenge to see what it can do for you!” – Sabrina M.
“Last night my husband and I started these two books! It’s only been 1 day but I can already feel change and see that God is about to wreck us.” – Stacy U. “Today we finished our 31 day Prayers challenge! This resource has really brought out the prayer warrior inside of me to spiritually fight and pray for my marriage. I’ve never felt more confident as a wife, and more comfortable with my husband. We’ve learned how to better serve each other and the importance of praying as a couple daily. God has really transformed my heart. I’m so thankful for this. It’s been an amazing blessing.” – Nalani B.